1. What is History Painting? History paintings are works of art that tell an important story in a single scene, with the aim of presenting the viewer with a moral of the tale. History paintings don’t just depict historical events, they can tell any kind of story - myths, biblical narratives such as The Deluge, and even stories made up by the artist. In the eighteenth and nineteenth centuries, the genre was considered the most significant art form, so painters would often make works on a large scale that included many figures, and in a style that emulated great painters of the past. All art students of the period were trained to make history paintings but in the twentieth century this was less common. Nevertheless, many artists have continued to depict historical events in new and experimental ways, and this exhibition shows the often surprising connections between the old and the new. As a genre, History Painting is defined by the subject matter and not the style of painting. Some were commissioned by participants in particular battles or political factions – and sometimes they are biased towards the commissioner. One example would be Thomas Daniell’s Sir Charles Warre Malet Concluding a Treaty in 1790 in Durbar with the Peshwa of the Maratha Empire1805 (not in the show), which was commissioned by the man who led the negotiations. In other cases, such as The Death of Major Pierson, the artist, John Singleton Copley, produced a dramatic picture based on a recent news event which had grabbed the public imagination. Pierson had rebuffed an attempted invasion of Jersey by the French, and died in the battle at St Helier. Copley was trying to produce a painting based upon the facts, but also transform it into an heroic scene that depicted Major Pierson as a martyr like Jesus Christ, dying for the good of the British people. In the 1800s, people would make special trips to visit these paintings, the viewing of which became an event in itself. Sometimes several years in the making, they were the blockbuster films of their day - with anticipation of a painting’s arrival building, an artist would often use this opportunity to redefine their status as a respected member of the art elite. A history painting was a rite of passage, a chance to demonstrate the artist’s skill and a signifier of their arrival in to the establishment. The exhibitions of the Royal Academy played host to many of these works throughout the eighteenth century and was a destination for those wishing to educate and entertain themselves and their families on current events, heroic victories and tragic defeats. At this time, Britain was at the height of her imperial campaign around the globe, and these works sought to inspire and instil the virtues of ‘noble’ bravery in ordinary citizens who looked up to generals, soldiers and noblemen presented so favourably in works by Benjamin West, John Singleton Copely and Joshua Reynolds. These figures were largely revered amongst the general population, in part because of their depictions on canvas, and the lessons played out in the scenes portrayed, which can be considered early examples of political propaganda. 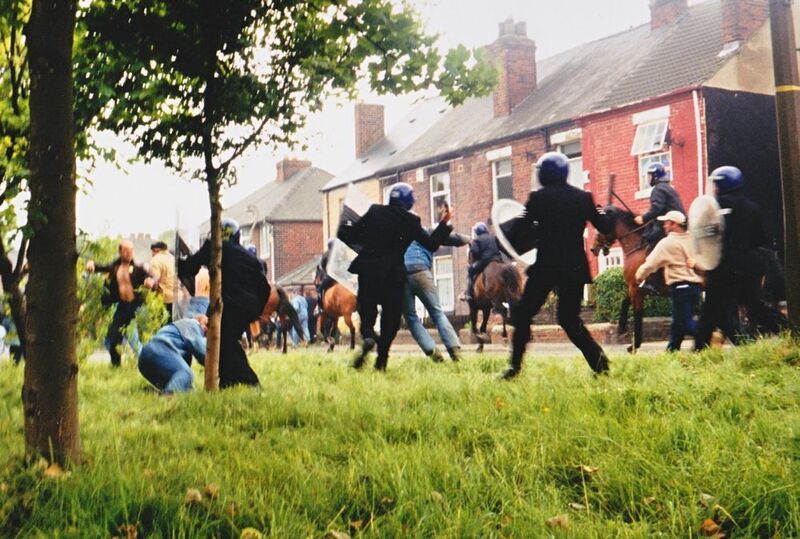 Jeremy Deller’s The Battle of Orgreave 2001, asks us to consider the 1984 Miners’ Strike as one of the great battles of history; to consider its legacy, and if a class struggle like this may again affect us. 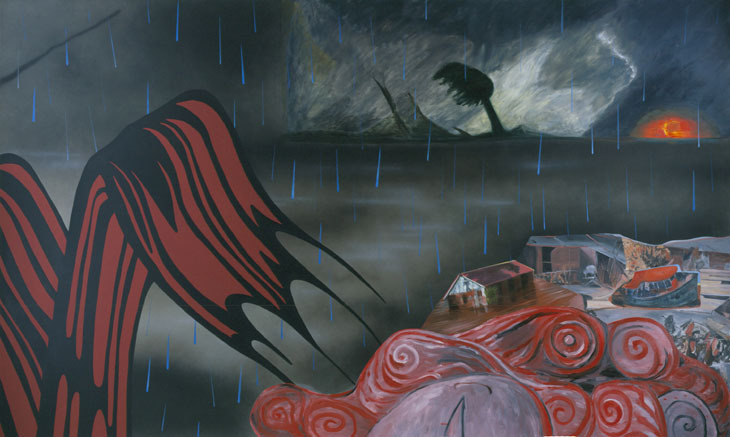 Dexter Dalwood’s Poll Tax Riots 2005, suggests that the riots of 1990 against the Conservative government’s taxation of the poor deserves to be regarded as equivalent to the fall of the Berlin Wall around the same time. These artworks do not simply report or reconstruct events, they provide a way of reflecting on them and preserving public reaction for future generations to observe. By contrast to works of art that recreate moments in history, today, we are able to consume images from the front line of conflict on a daily basis, many unmediated, with disclaimers to warn an audience of their graphic nature. Photojournalists, war correspondents, and eye witnesses provide us with a live feed of imagery from places around the world. Just as the first Gulf War was dubbed the TV War, the Arab Spring of 2010 became known as the social media war. Uprisings in Tunisa, Egypt, Syria and Libya were watchable in real-time on Facebook, Twitter and Instagram, with smart phones used as a means of gathering and disseminating information. Footage recorded in Cairo’s Tahrir Square in the morning by a protestor could realistically that same evening make the top slot on Channel Four News, CNN or Al-Jazeera, broadcast to an audience of millions. In 2003, Turner Prize winning artist and film director Steve McQueen was sent to Iraq as the Imperial War Museum’s official United Kingdom War Artist. He produced the work Queen and Country, which comprised sheets of postage stamps each bearing the photograph of a soldier killed in the conflict. The Royal Mail was petitioned to put these stamps in to circulation as an act of honouring the British military casualties in Iraq, but the campaign was not successful. The artist considers the work incomplete until the stamps go on public sale, as an active memorial. 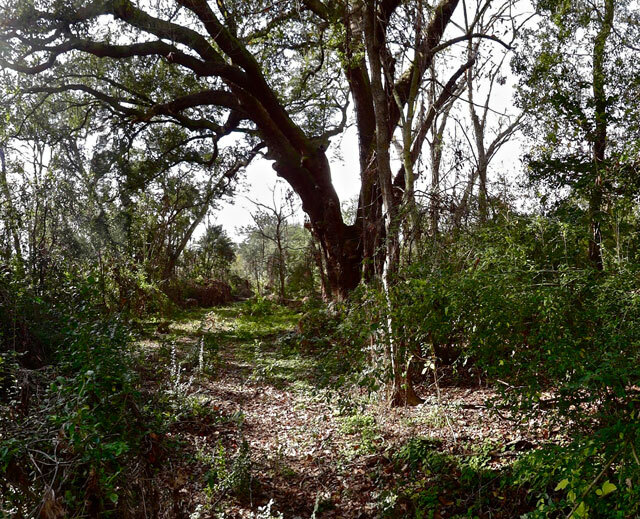 Included in the exhibition is McQueen’s Lynching Tree 2013, a photograph of a tree in Louisiana that was used to hang slaves, the graves of several of which lie at its roots. Though a contemporary image made when McQueen was making 12 Years a Slave, it reaches back in to history; an organic object that came to represent brutality, suffering, and an ‘ordinary’ landscape hiding historical wounds. Outspoken rapper Kanye West used this image as the backdrop for a performance of his Blood On The Leaves at the MTV Video Music Awardsin 2013, determined to make a statement on this dark symbol of American history.